Is Kenya beating Nigeria in Internet Business Opportunities? I was perplexed at The 3 Reasons Why Kenya is Beating Nigeria in Internet Business Opportunities. Could the author Wayan Vota simply be courting controversy as a means of drawing traffic to the blog? I will attempt to review the reasons listed in the blog post as to why the author is of the view that Kenya leads Nigeria in Internet Business opportunities. Safaricom? When did Safaricom start offering Internet connectivity over a 3.5G network? Only recently. As at the last time I was in Kenya (February 2010), Safaricom was still offering a special promotion of unlimited Internet access for only 9,999 Kenyan shillings with each subscription lasting only a week. The promo was obviously a means of raising awareness on its new 3.5G network. In contrast, MTN Nigeria has been offering super-fast Internet over 3.5G since the 2nd quarter of 2008. In addition, Zain and Glo Mobile both offer super-fast Internet using 3.5G technology covering all the top cities in Nigeria. Nigeria may have more mobile phone players, and cheaper voice rates, but their 3G data services are no where near the quality and reach of Safaricom. I used Safaricom’s mobile broadband service in Nairobi and Mombosa and frankly speaking, I have experienced faster Internet in Nigeria and Ghana. Safaricom’s service is no where near excellent. It disconnected intermittently and I had reconnect manually on several occasions. I have been too busy since I got back to publish a detailed review based on about 14 days of using Safaricom’s mobile broadband. Yeah. Seacom alone is a big deal. The hotel I lodged in Mombasa offers Internet connectivity using Swift Global. Swift Global is linked to Seacom. The speed was simply wickedly fast. Seacom was launched July 2009 and currently has an operational capacity of 100 Gbit/s. Considering Kenya (and the whole of East Africa) got their first taste of real Internet only recently, they still have some catching-up to do compared to their West African cousins. Nigeria’s telecom sector is years behind. Yes, the Glo cable is coming, but with the current restrictive regulation, I bet it will still be cheaper for Nigerian companies to buy bandwidth microwaved over from Benin. Really? The assertion by Wayan is highly inaccurate. Nigeria is presently the leading telecoms market in Africa with the most liberal telecom regime where several players are digging it in a highly competitive & dynamic market using various technologies. Nigeria is where GSM meets CDMA. Where 3.5G knocks head with EV-DO. Nigeria’s telecom not only offers a big basket of flexible options but is also the biggest in Africa. Nigeria has been served by the SAT-3 cable (whether directly or via Benin Republic is inconsequential in this context) since 2002. SAT-3 has a capacity of 120 Gbit/s; however, plans are in place to nearly triple SAT-3’s capacity to 340 Gbit/s soon thanks to technological advancements allowing 2.5 Gbit/s wavelengths to be replaced with 10 Gbit/s wavelengths. Wayan wrote about the Glo-1 cable with a heavy dose of pessimism. Glo-1 is powered by Globacom Limited, a privately-owned commercial entity. I wonder what “restrictive regulation” would stop Glo from pricing its broadband services competitively. Already, Glo Mobile recently announced new mobile broadband packages offering much more data for the same old price, leaving its competitors to play catch-up. Wayan forgot to mention that MTN Nigeria (a private entity) recently won a bid for the rights to SAT-3 and by inference, the submarine cable would witness a much better management in Nigeria. Wayan conveniently excluded Main One, another privately-owned submarine cable that is set to be launched soon with an initial capacity of 1.28 Tbits/s serving Nigeria and some other West African countries. Yet another cable is ACE. 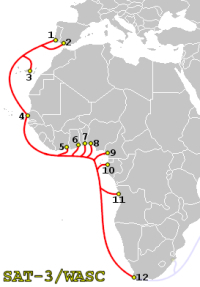 ACE (Africa Coast to Europe) submarine communications cable is a planned cable system along the west coast of Africa between France and South Africa. Etisalat Nigeria (a Nigerian telecom operator) is part of the ACE consortium. ACE would become operational in 2011 with a minimum capacity of 1.92 Tbit/s. Nigeria: 11,000,000 Internet users as of Jun/09, 7.4% of the population, per ITU. Population: 154.7 million (UN estimate). Kenya: 3,359,600 Internet users as of Jun/09, 8.6% of the population, per ITU. If there is any single factor that would be the albatross of e-commerce development in Nigeria, it would be the lack of power. However, I am forced to reflect in this direction: if Nigeria could achieve this much as epileptic as power supply is, what wouldn’t it achieve when there is adequate supply? I am far from being complacent and desperately hate the poor power supply in Nigeria but the modest achievements in the present hostile business environment deserve some commendation. While it is true that Kenya is the regional IT hub in East Africa, Nigeria is the IT hub of a much bigger regional block (West Africa). In summary, Kenya does not beat Nigeria in the Internet business arena. It is a good thing that Africa gets more Internet connectivity but if there is any country to pitch against Nigeria in Africa, it is certainly not Kenya. too early to decide. technologies nowadays were so fast growing yet we know that both countries were capable of making their way to the top of the internet market. @moniquedavis80: you are right! If Kenya is on the lead now, Nigeria might find ways to lead. The wiser may lead the way. Offline business opportunities are just as vast and endless as those available to you on the Internet. Be sure to do plenty of research in the area of interest and expertise that you looking into to include these types of unique business opportunities as well. to start with ,since 2009 the number of internet users in kenya has more than doubled n stands at 8.3 million as of september 2010 thanks to safaricom’s 3G network.more are to join the group as airtel n orange are also rolling out 3g.2G provider yu is now offering the lowest monthly charge ever for internet subscription at$6.12(shs.500)even a teenager can afford that! 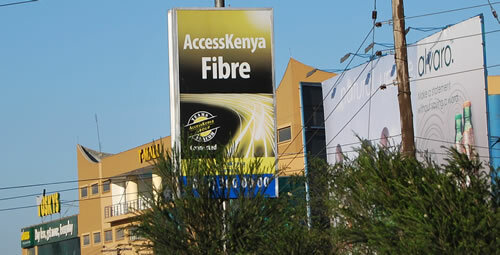 plus kenya too has major investment in fibre optics.KenyaDataNetworks alone has 20,000 km of fibre in the country.this xcludes telkom kenya.s large network n others like jamii telkom n access kenya.kenya is connected to the 120g/bitsTEAMS owned by the government the 1.28 T-Bits SEACOM which added an express fibre between kenya and south africa kenya is also connected to the highest bandwith cable in africa.the 3.84 T-bit EASSY cable. finally 4G Is coming to kenya with safaricom this year.now compare with nigeria?